After your ship docks in St Maarten's cruise port, see the sights on both the French and Dutch sides of the island during this 4-5 hour tour led by a local guide. Enjoy beautiful views of the island and its shorelines at several lookout points, then pass through the legendary Maho Beach and Orient Beach. Spend some time walking and shopping in the town of Marigot, and enjoy a shopping stop in Philipsburg as well. Round-trip transportation from the cruise port is provided. The tour guys are very friendly , patiently and knowledgeable.Recommended!Good good good! !Why do you require us to write 100 wording??? This tour gave us great insight into the island's past, present post-hurricanes, and gave us hope for the future of St Maarten. The island was devastated by the hurricanes, but the spirit of the people was strong. Our guide was incredible - we ended up being the only two on the tour, and he made sure we enjoyed and learned as much as we could. We didn't just see statues - but Paul explained who the people were and why they are important. We saw all the typical tourist sights while getting more details about the island itself than expected. I definitely recommend - it was a great experience and allowed us to give back to an island in need, and definitely touched us in ways we will keep with us. I look forward to returning in a year and taking this tour again to see how the island has recovered further. Our tour guide Paul was great! A local who had first hand knowledge of the devastation from the recent Hurricanes that hit the island. Heartbreaking to see and hear of what they have gone through. He was very informative though. Great tour. 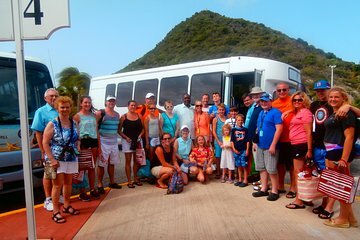 Great tour of St. Maarten. Exactly as advertised. Perfect for seeing the whole island in a short period of time. Plenty of time for souvenier shopping and having something to eat. Would absolutely recommend it. Paul, our guide, was very accommodating. He showed us many interesting areas around the island. Wish I had taken a ship tour. Our guide Paul was bias against the French, something he should have kept to himself. We were told shipping at the ship was much better and cheaper than other the French section of the Island. Trouble is, he didn't get us back to the ship area in enough time to shop. We had to rush to make our all aboard time. One couple on the group of 6 was constantly late after stops. Had it been impressed on them to be on time, we may have had more free time at the dock shopping. Before departing for the tour, Paul was told to have us back by 2 pm. all aboard was 2:30 We got back at 2:20. In total, 4 of us sat in the van for 20 minutes waiting for 2 other travelers who couldn't have cared less as their ship all aboard wasn't till 5 pm. Great guide and tour. Were able to go to both sides. Would rather have more time at Maho beach and less time in Marigot or Philipsburg. Maho beach was the most fun. Ate lobster in Marigot and was ok but nothing special at Rosemary's. Would take a pass on that. The tour was exactly as described. There were only 4 of us and the driver Roland gave us an experience we will never forget. We learned the history of the two nations and more. We loved the planes over Mahoney beach, the pastries at Sarahfinas apple tart is a must! Bring cash they don't take cards. and shopping in Philipsburg. Roland walked us a short distance into the heart of the town and gave us a time to meet back. We explored Philipsburg stopping at the Guavaberry Emporium where we sampled and bought this local liquor. We really got the flavor of this beautiful island thanx to this tour. We highly recommend this! The information from Viator was the tour would begin 30 minutes after my cruise ship docked, not a specific time. We docked early and was able to get off ship early. When we arrived at meeting place the tour had already left because everyone else had arrived on a different ship an hour earlier. We were taken to join up with the tour. Coordinating tours with ships would have been nice. The tour guide/driver was nice but he did not speak loud enough for those of us in back of van to hear. He did not use a microphone. He also did not say much except point out trees. We did see the whole island. I don't think I would book with Viator again.